IA is a virtual artist brought to life as part of the VOCALOID3. IA -ARIA ON THE PLANETES- and IA ROCKS are both ranked #1 on Amazon Japan Music Software chart. IA-related videos have collectively garnered more than 100 million views. She started her artist career by embarking on a live tour in 2012, followed by a dance music collaboration with the game, "GROOVE COASTER", as well as collaborations with several fashion brands. 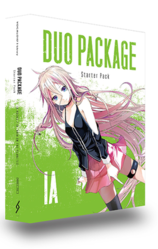 IA is also the featured singer of KAGEROU PROJECT by the multi-talented JIN and also included in Evangelion final chapter comics CD. Since 2013, IA has reached out to her international audience by doing live shows in France and Taiwan as well as the string of successful concert movie screenings in New York, Seattle, San Francisco, and Los Angeles.